In honour of the 100th anniversary of the November 11 armistice that ended the First World War, we are reprinting one of Corporal Churchill’s poems. 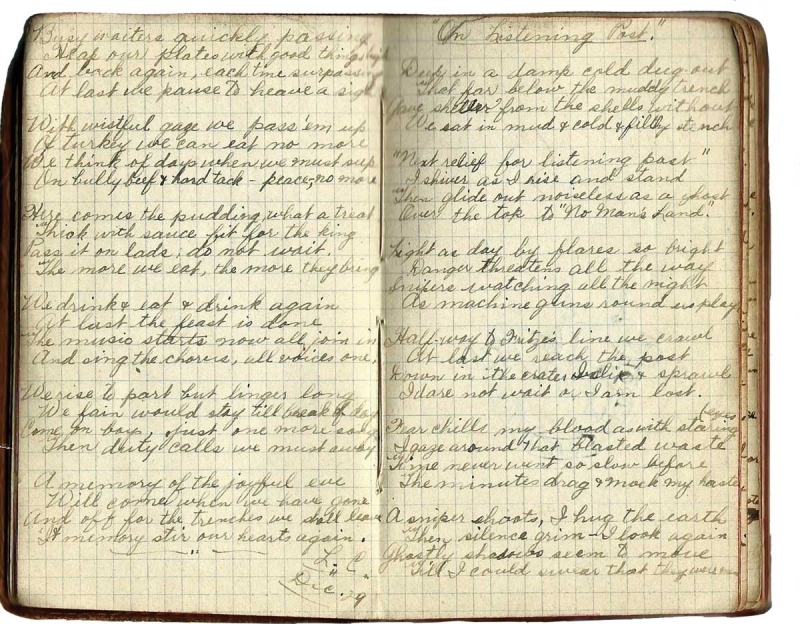 Pages from Corporal E. Leroy Churchill’s journal. Photograph by Don Molyneux. Journals written by Corporal E. Leroy Churchill, 8th Battalion, CEF, during the First World War were rediscovered 100 years later when his descendants began to record their family history. Churchill, who was from Alberta, kept a daily record of his wartime experiences and also penned poems that offer his unique insight into life in the trenches. In honour of the 100th anniversary of the November 11 armistice that ended the First World War, we are reprinting one of Corporal Churchill’s poems. And cautiously my way retrace. Corporal E. Leroy Churchill in uniform. Photograph by Don Molyneux.